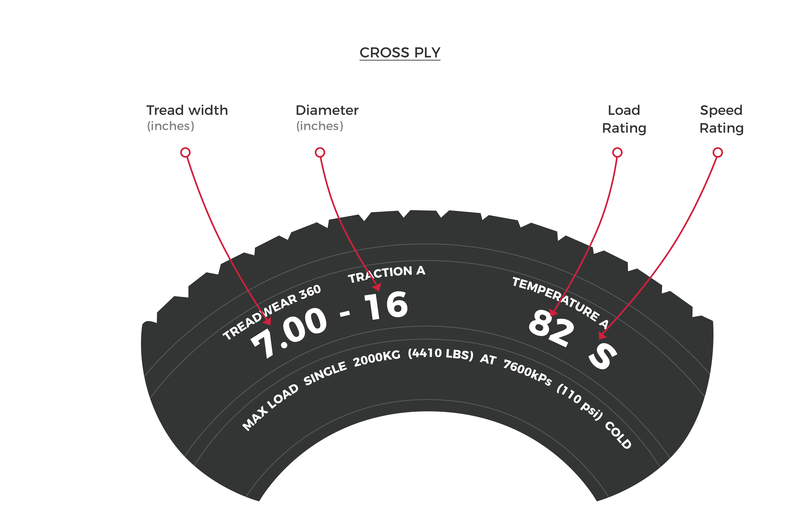 Crossply and radial tyres use different size markings. Crossply tyres are measured in inches. The first number (7.00, for example) relates to the overall section width (seven inches), the second number (16, for example) is the diameter of the wheel it fits (16 inches). 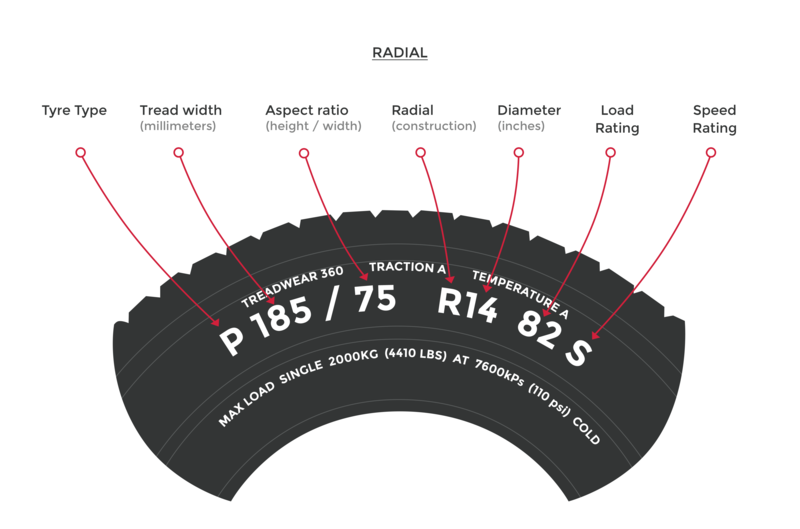 Radial tyres are measured in millimetres and inches. The first number (say, 185) is the overall section width in millimetres. The two figures number after the forward slash (75, for example) relate to the sidewall profile of the tyre. The profile is a percentage of the width of the tyre. If no number is shown, then the tyre is 80 profile. The ‘R’ before the next two numbers denotes the tyre is a radial, and the diameter of the wheel the tyre fits follows this. You should aim to match the size of your new tyres with those recommended in your vehicle’s handbook — or we can check for you. The tyres on your vehicle now aren’t necessarily the correct size. 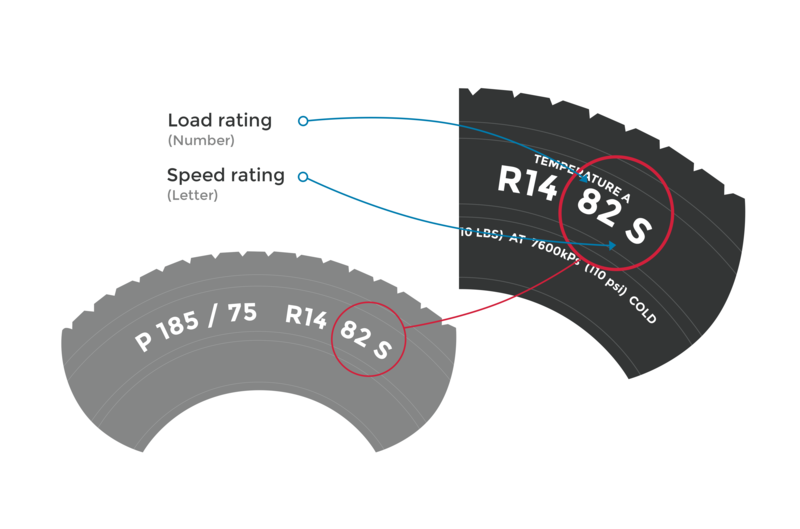 Where two figures and a letter are displayed together (ie 82 S) on both types of tyre, this is the load and speed rating. This is explained in more detail with reference charts lower down the page. The load and speed ratings on a tyre are displayed as a number (82, for example) and a single letter. These are deciphered for you in the tables below. You should aim to match the load and speed ratings on your new tyres with those recommended in your vehicle’s handbook — or we can check for you. The tyres on your vehicle now aren’t necessarily the correct ones for it. This table shows the maximum speed a tyre is safely designed to travel at. The date code is four digits long. The first two digits represent the week of production, and the second two represent the year. The tyre in the picture was made in the thirteenth week of 2011. The date code is three digits long. For the Nineties this was followed by a triangle. The first two digits represent the week of production, the third digit represents the year. The tyre in the picture was made in the first week of 1996 (note the small triangle on the right). The three-digit code was also used in the Eighties, but without the triangle. The format is otherwise exactly the same as the later system. So, the tyre in the picture was made in the seventh week of 1981. If your tyre doesn’t have any of the markings above, it was made before 1980 and should be replaced as a matter of course. The title is a bit of a misnomer because no radial tyre is an exact-size replacement for a crossply. Crossply tyres have a sidewall profile that is between 95 and 100 per cent of the width of the tyre. The tallest profile you’ll find in a radial is 80 per cent. So, radial tyres are always going to look smaller in the wheelarch than a crossply. That said, there are plenty of commonly-used radial replacements for crossply tyres, and these are shown in the table below. These aren’t specific recommendations, and if you are planning to swap from crossply to radial tyres, give our experienced team a call first on 01590 612261. Radial tyres generally require higher pressures than crossply tyres. Again, our team can advise on car-specific pressures.